I don't just mean movie (MCU) Loki--though we will be talking about him. I mean Marvel Loki in general. This discussion will include spoilers for Thor: The Dark World, the end of the comic Siege, issues #622-645 of Journey Into Mystery, and Volume 2 of Young Avengers, and slight vague thematic spoilers for issue #1 of Loki: Agent of Asgard. Proceed at your own risk. So the other day I was watching Thor: The Dark World for the umpteenth time, and I was thinking about Loki's redemption story arc. There is no doubt in my mind that MCU Loki wants to be redeemed. His interactions with his mother and Thor scream of a man who has dug himself in too deep and has no idea how to pull himself out. Take for example Loki's sheer joy when he's walking the halls of Asgard with Thor. That is not merely the delight of a man on parole. That is the joy of a person reunited with his best friend--that after two years separated from his brother is finally side by side making mischief with him again. Also remember the regret on his face when Thor said he wished he could trust Loki. Loki wishes Thor could trust him too. But he has no idea how to make that happen, no idea how to earn that trust back after he has so deeply and repeatedly betrayed him. 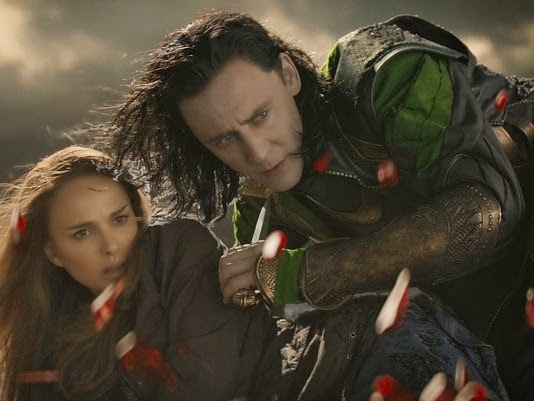 Loki does his best in the battle--nearly sacrificing himself to save Jane (a sacrifice Thor saves him from having to make and thus Thor redeems himself of not saving Loki at the end of Thor). And then Loki does sacrifice himself to save Thor. Sacrifice. The easy road to redemption. "Easy?" you scoff. "How is it easy? It's literally sacrificing your life for someone else! That's not easy!" Yes, sacrificing yourself for someone else isn't easy. But sacrificing yourself--dying--is the easiest path here. Because Loki doesn't have to do anything after that. He's dead. He doesn't have to worry about re-earning Thor's trust, about being actually being a better person. He doesn't have to do any more work. It's easy. Which is why Loki doesn't reveal to Thor he's alive at the end. Because he wants Thor to love him, to trust him again, and he has no idea how to earn that back. Redemption is too hard. So he dies and lets Thor remember his sacrifice. Lets Thor love his memory. Let's compare this with 616 Loki. What did he do? Sacrifice himself to save Asgard. 616 Loki did not just stop there. Earning trust is too hard, too difficult for him. So he's reincarnated as a boy, but without old!Loki's memories and magic. Old!Loki lets Kid!Loki be the one to deal with all the crap Old!Loki left behind. He lets Kid!Loki earn back the trust of Thor, the Warriors Three, the All-Mother, and Asgard. And then when Kid!Loki succeeds, when Kid!Loki has finally reached a place where people assume he's a good kid who has the best of Asgard at heart even if he doesn't always go about things in a traditional Asgardian way, Old!Loki kills him. You read that right. Old!Loki kills Kid!Loki. Kills him and takes over his life. He let Kid!Loki do all the legwork, all the hard part, and then stole his body from him--obliterating Kid!Loki from existence. MCU Loki is no different from his comic counterpart. Changing who he is and earning back the trust of the people he loves is too hard. So he goes for the easy path. He cheats. And it always backfires, as Young Avengers Volume 2 spent its entire story-arc showing us. You can't cheat the redemptive story-arc. And I'm sure Thor 3 will show us that just as well, though perhaps in not quite as a meta way. So many of us want to cheat, just like Loki. We don't usually go as far as to sacrifice our lives, but we think, "I want to be different, therefore you--the wronged party--should immediately accept that at face value and be okay with this." Alas, it doesn't work that way. Trust once broken is not so easily fixed. It takes time and hard work to reforge broken bonds, to convince people you are a new person. MCU Loki will get his comeuppance in Thor 3, I promise you. 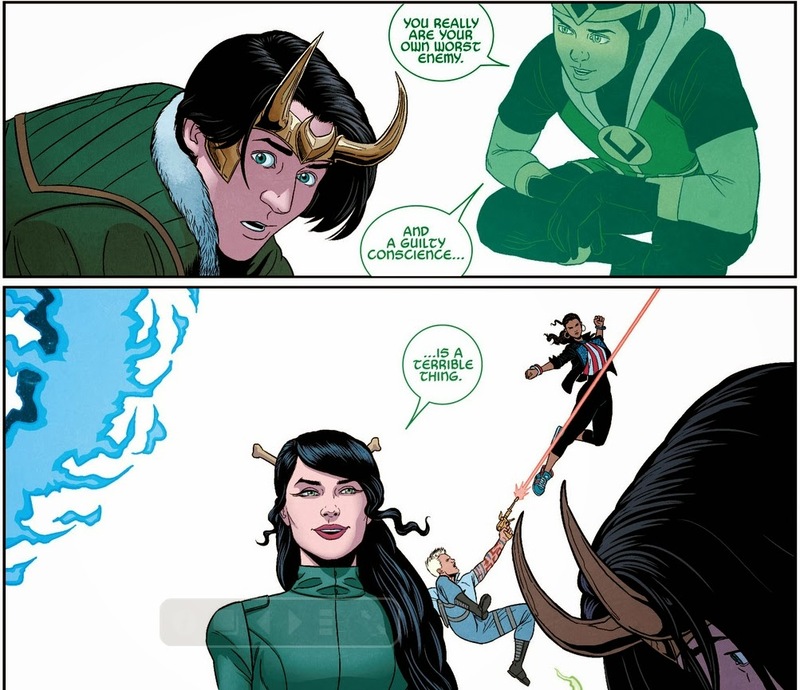 Old!Loki received his due already in Young Avengers, and after reading Loki: Agent of Asgard issue #1, it's obvious he is still working through cheating the story-arc and his crimes against Kid!Loki. You cannot cheat the redemptive story-arc. You must slog through and be the new person you claim to be. That is the only way to regain trust, to regain the relationships and bonds you once had but broke. Remember, always remember: Don't be Loki.